What a shape! Evan Quiros brought his DO335 back this year and was able to squeeze in a few solid flights on this super complex model. How about the fact it has a 3w80 up front and a Zenoah G45 out back?! Larry Laughlin is a local modeler and he always brings FAST airplanes with him. This year, as part of his stable he fl ew this Tamjets F-18, powered by a Jetcat P160. The genuine article! Among other full scale aircraft we were all treated to some low and fast flybys by this North American P-51D. Merlin Magic! Mandatory pilots meeting held at the beginning of the day. The guys in the foreground are from the local host club, the Arvada Associated Modelers. They had over 75 volunteers to help at the event and they did an outstanding job of keeping everything moving smoothly. Brian O’Meara has a passion that is helping to keep this great hobby of ours alive and well. Not a new face in the hobby, you will find him and his models gracing model magazines dating back to before many of our readers were even born! In all of those pictures and memories, there is a recurring theme in all of his subjects, WARBIRDS! 12 years ago, Brian released his opus on the Warbird community, WARBIRDS OVER THE ROCKIES. He, along with his lovely wife Bonnie, started from the ground up, taking all of the many decades of both awesome model event experience ones as well as a few terrible ones to put together a Warbird modeler’s paradise. Great flying site, central location (at least for Western US pilots), good food, excellent banquet…….throw in some serious pyrotechnics and a full scale airshow, shake well and voila! Right, if only it were that easy. Having some involvement in putt ing together a show of this size, I can tell you it is the passion that makes it all happen. The passion is also benefitting another group beyond the model Warbird community; mental health patients. The O’Meara’s donate all proceeds from the event to the organization Mental Health America/Colorado which averages a significant $25,000 each year. Gate Guard at the WINGS OVER THE ROCKIES museum which hosted the Saturday night banquet. The massive B-52B is quite impressive to walk under and this particular one has some interesting history. It was serial #005 and was delivered in 1955, the year the plane was debuted. Joe Mcbride came over from California and brought his MIBO A-10 to blow up stuff during the pyro show! As part of the Scale Squadron of Southern California, I snuck this shot of the pilot goofing off during the groups Friday night hang out bash at the fi eld. Maurice Morgan came in to town from New Mexico with a bunch of airplanes, including this giant TBM Avenger. Spanning over 100”, it was a nice change of pace to see this Naval Bomber in the air each day. Brian and Bonnie pose in front of Brian’s Balsa USA 1/3-scale Stearman. A 1/3-scale replica of Bonnie has been installed in the cockpit wearing a Team Futaba shirt just like the full scale Bonnie! Brian O’Meara got to play with a few of his toys while he simultaneously ran the event. This B-25 was built from a Ziroli kit and powered by a pair of Zenoah G-62’s. Nothing beats the sound of a well tuned twin! Jim Hammond’s scratch built Spitfifire, 1/4 scale 110”. It took him 8 years to complete the model and it brought home the Critics Choice award this year. Brian O’Meara presents Jim Hammond with the Critics’ Choice award for his gorgeous scratch built 1/4-scale Spitfire. The only criteria for participating in the event are that your model must be a warbird; any size, any era. I will let the pictures and their captions do the talking regarding this year’s entrants. There were plenty of interesting subjects and lots of great flying all weekend long. WARBIRDS OVER THE ROCKIES is setup as a fun ? y type of event. There are no judges to worry about with the exception of a beauty contest set of awards given out for “Best of” at the Saturday night banquet, more about this later. Just fly whenever you want and enjoy the modeling camaraderie for the rest of the day. Participants come from all over the place to attend, including from as far as Australia and Western Europe. Set in Arvada, CO on a huge piece of state land, the airfield has the benfit of the beautiful Colorado Rockies as a picturesque backdrop. Located just Northwest of the metropolis of Denver, visitors get the best of both worlds. The weather this year was superb with sunny skies and temps in the mid-80’s. A bit warm for September in Colorado, but no one was complaining aft er the surprise snow we got at last year’s event! All four days were perfect flying conditions with the only challenge being a bit of a crosswind on Sunday. It always separates the men from the boys, but even so, there was plenty of action all day long. Each of the four days, all in attendance were treated to a really cool halftime show. This little bipe was scratch built by Michael Morgan. Modeled after a Curtis SOC-1, it is unique subjects like this that make scale modeling so darned interesting! Joe Casteleo pulling his CARF SIAI Marchetti up for a show pass, Smoke On! Power supplied via a JetCat STP5turboprop. Wicked sounding in the air and the twin smoke trails were spectacular! A full blown pyrotechnics crew was brought in to load the field up with explosives each morning. During the halftime model flying demonstrations, radios were used to coordinate between the pilots and the pyro crew for strafing and bombing runs. Huge fireballs and loud explosions really made for an exciting show! Aft er the model show, an FAA waiver was in place to have a full scale airshow. A full range of full scale warbirds were flown, including biplane primary trainers to Korean War era fiighter jets. It was really cool and the planes’ flybys were up close and personal, much closer than you normally get to see at full scale airshows. Brian Young volunteered to be the victim during the half time Warbird gaggle each day. His Meister Zero fi t the part with a beautiful smoke trail billowing from the DA100 twin. I have to mention my traveling companions for this trip because their presence definitely had an impact on me and any other scale modelers in training who took advantage of the opportunity to chat with them. Making the trek with me from Florida to Colorado were fellow modelers Richard Uravitch and David Platt . Two scale modelers who are, in my eyes, legends in the Scale Modeling Community. They have both been doing this since before models had retractable landing gear and back when turbine jet models were just a dream. If you see guys like these two or Frank Tiano or Brian O’Meara, etc. be sure to make some time to see what they are up to, check out their model setups and even their field equipment. They are all approachable and happy to share their knowledge. Of course, if they are in the middle of programming their radio for the last competition round at Top Gun, you may want to give them some space, but at a relaxed event like this they are usually just as prepared as you are to talk about model airplane stuff till they are blue in the face. I would be surprised if you don’t walk away with a tip or trick to add to your knowledge base and I know, at least for me, I can use all of the help I can get! Rich was out there for the same reason as me, to cover the event for a magazine. David Platt , on the other hand, was personally invited by Brian O’Meara to come out as an ambassador for our genre. A Scale Guru “member at large” as it were, he made himself available all weekend to anyone who had a scale question about his history as a designer/builder and even lent an ear to general model airplane questions. He also jumped on the PA system on occasion to accompany Sam Wright with his announcing duties, flexing his trivia muscles enough to stump even the experts in the crowd. While in Colorado, the three of us were afforded the chance to visit Brian’s shop during our downtime and what a treat that was, like a mini museum on its own. Brian had models dating back to dope and silkspan stuff from the sixties all the way to modern turbine powered heavy metal scattered about his numerous workbenches. Of course, I even picked up a few ideas while we were there to incorporate into the shop in Florida. Having seen plenty of great flying Vailly warbirds in the past, I was excited to see Brian Young show up with his blown up Vailly FW190A. The design is based on Roy’s 91” version, but has been blown up to 113”. Brian did a great job building this Butcher Bird and it flew just as well as the “little one”. 3w170 twin for power, 70 pounds. Chris Puckett showed up with his Top Gun award winning Meister P-47. Loaded for bear, he heads out for another sortie in the smooth Colorado air. 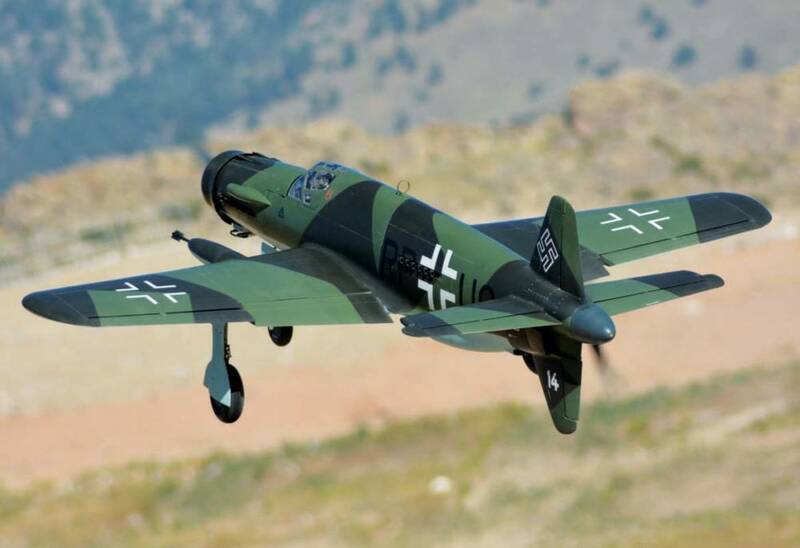 Keith Hedge from the Vegas contingency scratch built this Bucker Jungmeister. A pre WWII German advanced trainer, the full scale plane is still regarded as a marvel for its nimbleness to this day! I once watched Kermit Weeks do a 500 foot one wheel touch and go at his grass fi eld in Florida. Saturday night we made our way to the “Wings Over The Rockies Air Museum” located at what was once the Lowry Air Force Base in downtown Denver. The museum houses a surprisingly diverse group of Military and Civilian aircraft including a massive B-52 Stratofortress at the front door and a B-1A Lancer tucked in one corner of the hangar. The museum was closed for the private event and several cockpits were opened up for photo opportunities. The atmosphere was very relaxed with an open bar which was followed by a lovely buffet style dinner. Aft er the dinner, the special awards ceremony was held. The trophies (see sidebar for list) presented were totally awesome. Tighe O’Meara handmade each one which included 1/72, 1/48 and 1/18 Scale warbirds mounted to their tops! The last, but not least, purpose of the event was to host the auction. Two things worthy of note about this auction; the prizes were donated by the generous sponsors (see sidebar for list) and the proceeds were donated by the generous hosts to Mental Health America/Colorado. There were some awesome deals to be had as well as a handful of bidders coaxed by Brian into going above and beyond to help support his charity. Again, Brian’s passion showed as he spoke about his cause. His comment that remained with me was that he chose Mental Health as his cause because it does not have the necessary visibility for whatever reason; whether it is because people are in denial or just don’t want to talk about it. It is models like this one that most would walk by without giving it a second look. I am glad I gave it the second look because the closer I looked, the more I saw. Keith Hedge did an excellent job building this Ryan STA from a Fred Reese kit. A true model builder, this plane spans 92”and weighs, get this, 18 pounds! Some warbirds have that much lead in the nose for balance! I was impressed last year, which was my first time ever attending the event, but this year WARBIRDS OVER THE ROCKIES has solidified its position with me as a premier Warbird event. Between the great site, full size airshow and pyro show, you can’t get a much more fun time crammed into a single space. Combine that with great friends and the beautiful scenery and you can see why the event is growing each year. A few of us Florida Warbird guys are already planning how to get our planes out there for next year, so come out and join us! Next Video: E-flite Carbon-Z P2 Prometheus Bipe In Action!